America's history and political ethos are all about liberty. The Declaration of Independence declares that life, liberty, and the pursuit of happiness are unalienable rights, but notice how both life and the pursuit of happiness also depend on liberty as a fundamental bedrock of our country. We use the word almost as a cliche. But do we know what it means? Can we recognize it when we see it? 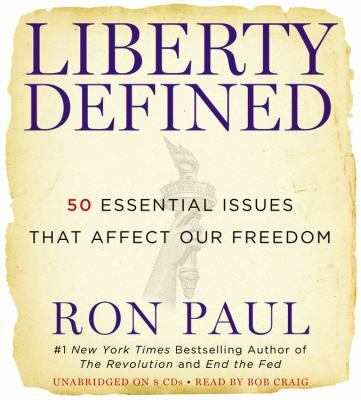 More importantly, can we recognize the opposite of liberty when it is sold to us as a form of freedom? The definition of liberty I use is the same one that was accepted by Thomas Jefferson and his generation. It is the understanding derived from the great freedom tradition, for Jefferson himself took his understanding from John Locke (1632-1704). I use the term “liberal” without irony or contempt, for the liberal tradition in the true sense, dating from the late Middle Ages until the early part of the twentieth century, was devoted to freeing society from the shackles of the state. This is an agenda I embrace, and one that I believe all Americans should embrace. To believe in liberty is not to believe in any particular social and economic outcome. It is to trust in the spontaneous order that emerges when the state does not intervene in human volition and human cooperation. It permits people to work out their problems for themselves, build lives for themselves, take risks and accept responsibility for the results, and make their own decisions. Do our leaders in Washington believe in liberty? They sometimes say they do. I don't think they are telling the truth. The existence of the wealth- extracting leviathan state in Washington, DC, a cartoonishly massive machinery that no one can control and yet few ever seriously challenge, a monster that is a constant presence in every aspect of our lives, is proof enough that our leaders do not believe. Neither party is truly dedicated to the classical, fundamental ideals that gave rise to the American Revolution. Of course, the costs of this leviathan are incalculably large. The twentieth century endured two world wars, a worldwide depression, and a forty- five- year "Cold War" with two superpowers facing off with tens of thousands of intercontinental missiles armed with nuclear warheads. And yet the threat of government today, all over the world, may well present a greater danger than anything that occurred in the twentieth century. We are policed everywhere we go: work, shopping, home, and church. Nothing is private anymore: not property, not family, not even our houses of worship. We are encouraged to spy on each other and to stand passively as government agents scan us, harass us, and put us in our place day after day. If you object, you are put on a hit list. If you fight to reveal the truth, as WikiLeaks or other websites have done, you are targeted and can be crushed. Sometimes it seems like we are living in a dystopian novel like 1984 or Brave New World, complete with ever less economic freedom. Some will say that this is hyperbole; others will understand exactly what I'm talking about. What is at stake is the American dream itself, which in turn is wrapped up with our standard of living. Too often, we underestimate what the phrase "standard of living" really means. In my mind, it deals directly with all issues that affect our material well-being, and therefore affects our outlook on life itself: whether we are hopeful or despairing, whether we expect progression or regression, whether we think our children will be better off or worse off than we are. All of these considerations go to the heart of the idea of happiness. The phrase “standard of living” comprises nearly all we expect out of life on this earth. It is, simply, how we are able to define our lives.